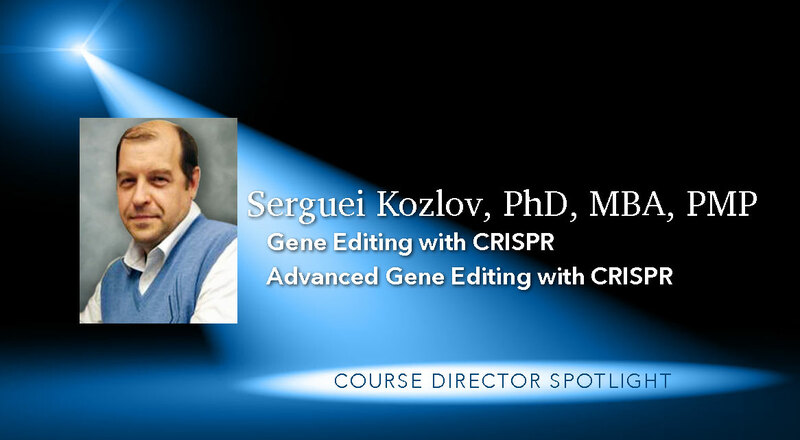 Dr. Serguei Kozlov is the Principal Scientist/Team Leader at the Frederick National Laboratory for Cancer Research. He is the Workshop Director for BioTracⓇ courses: Gene Editing with CRISPR and Advanced Gene Editing with CRISPR. Tell us a bit about your experience working with CRISPR. "I am an expert user of CRISPR technology, specifically in the context of applying CRISPR based genome editing tools towards establishing novel preclinical animal models of complex human maladies, such as cancer and inflammation. I’ve used CRISPR to answer various questions about disease biology and as an experimental platform for more efficacious drug development. I have also initiated and conducted several projects aimed at optimization and improvement of CRISPR technology, particularly to conduct precision somatic mutagenesis in differentiated intact tissues." Why is CRISPR such an exciting technology? "The advent of CRISPR and its adoption for gene editing of complex eukaryotic genomes is considered a major breakthrough discovery of the last decade. The flexibility of current CRISPR toolkits is very exciting. CRISPR can accomplish complex mutagenesis designs with a high success rate, providing important insights into intricate biology processes in actual living organisms, such as in mouse models. CRISPR offers a remarkable pathway towards deeper evaluation of a diseases’ molecular biology, genetics and biochemistry. Many these discoveries are directly relevant and highly encouraging for the development of more robust, better tolerated diagnostic and therapeutic strategies for the diseases that have been modelled with CRISPR applications." What are the primary applications for CRISPR? "At present, CRISPR technology has had the most impact in the field of vitro reagents (modified by genome editing cell lines) development, with an emphasis on carrying desired modifications in genes of interest and the proven functional assessment of specific gene functions. CRISPR is also rapidly entering the germline and somatic mutagenesis fields to aid in the more accurate and clinically relevant modelling of different pathologies. In addition, CRISPR is being used to establish faster interrogation models of gene functions in vivo and for the design of sgRNA/CRISPR libraries for functional identification of biologically relevant and diseaserelated genes. CRISPR methodology is also rapidly gaining recognition as a promising tool for sensitive multiplex diagnostics of pathogenic conditions, such as oncogenic mutations or the presence of infectious agents. CRISPR clinical therapeutic potential is currently under evaluation as well; several approved clinical trials are now actively recruiting patients." What types of research is your lab focused on? "Establishing and validating various murine cancer models (and also involving in vivo/somatic/germline variations of CRISPR technology) for the purpose of facilitating informative preclinical oncology drug development and accelerating clinical translation for promising therapeutics." Why should a researcher attend one of your workshops? "To get smarter–and more pragmatic, too– while gaining confidence about applying CRISPR technology in day-to-day research activities. CRISPR is a powerful tool to advance science that requires a deep understanding of its strengths and weaknesses, as well as the acquisition of a distinct set of versatile skills. This workshop will teach researchers how to build a successful CRISPR experiment from identifying biological problems to analyzing the final set of data. This workshop is a strong introduction into key facets of CRISPR technology that is comprehensive and will empower researchers to independently utilize CRISPR technology in their own labs." Why do you enjoy leading Bio-Trac workshops? "This is really a three-day adventure for all of us in the classroom and the lab. The Bio-Trac workshops provide a great opportunity to interact with a very diverse pool of attendees. These workshops consistently challenge me to deliver instruction in a way that meets the individual preferences and learning styles of each student cohort. I also enjoy the deep spirit of collegiality and the “all hands on deck” spirit that carries through the entire three-day training. I want to make sure everyone learns the most they can and takes home the most actionable blend of theoretical knowledge and practical skills." " The biggest differentiator for Bio-Trac workshops is definitely the format. It is a very rare treat for even well-prepared students to get a three-day immersion into a remarkably balanced and ‘elastic’ blend of in-class presentations and state-of-the-art experimental assignments. This intermingling of activities effectively delivers on a key workshop objective: Enhanced learning within short period of time and building confidence for future CRISPR application in participants’ laboratories."